"To mount an operation of this size and begin to execute this plan, (RCMP) would have had to have approval at the highest levels, and that takes considerable time, and I suspect those decisions were made weeks ago." said Grand Chief Stewart Phillip. 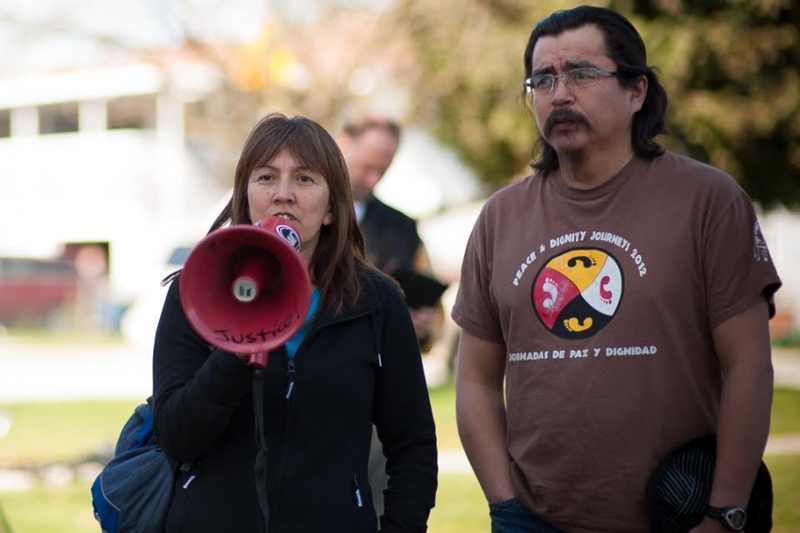 Unist'ot'en Camp leader Freda Huson and her husband Toghestiy have issued a loud and clear message to oil and gas companies with eyes on their land. Photo courtesy of Creative Commons. Police officers have booked up hotel rooms in Smithers and Burns Lake in preparation for an invasion of the Unist'ot'en Camp, said Grand Chief Stewart Phillip of the Union of BC Indian Chiefs. The news came in this morning, said Phillip, confirming what have previously been thought to be rumours of an impending "mass arrest operation" on traditional Unist'ot'en territory in northwestern B.C. Calls to hotels in Burns Lake and Smithers by Vancouver Observer suggest they're not completely full. It's unclear how many, if any, hotel rooms have been booked by RCMP. The Unist'ot'en Camp recently gained major media attention for refusing to allow oil and gas companies to access its land, including Chevron and TransCanada, and denying entry to pipeline officials at the checkpoints it maintains on Moricewest Forest Service Road and Chisolm Road. “I don’t want to disclose names, but there have been top political leaders who have contacted senior levels of the RCMP again, attempting to persuade them to stand down," said Phillip, who will be heading to the Unist'ot'en Camp on Sunday to support its residents and bear witness to any police action that may take place. "To mount an operation of this size and begin to execute this plan, (RCMP) would have had to have approval at the highest levels, and that takes considerable time, and I suspect those decisions were made weeks ago." Unist'ot'en Camp residents and supports tell oil and gas hopefuls that no one is allowed on their land without their explicit consent. Photo courtesy of Unist'ot'en Camp Facebook page. "We understand that there has been some discussions on social media that don't accurately reflect the RCMP's action or the situation," she said. "To date, there has been no police action. It is our understanding that discussions between industry and the Wet'suwet'en are still possible." Phillip confirmed that RCMP have indicated that "they really want to keep the peace," but these statements seem to contradict the evidence on the ground. He said the Unist'ot'en Camp members have spotted what they believe to be two RCMP campsites near the Indigenous residence, likely being prepared to serve as a base of operations for officers and equipment. "They're in the midst of the logistical undertakings," he explained. "There's a routine in terms of bringing in their forces, taking on supplies and developing base camps. There's a very paramilitary dimension to all of this."